Without any spoilers, one of the strengths of True Vert is the ever-present tension Josh experiences both internally and externally. I enjoyed following Josh’s thought processes as well as his interactions with other characters. I continually wanted to know what decisions he would make and what would happen to him as a result of his decisions. 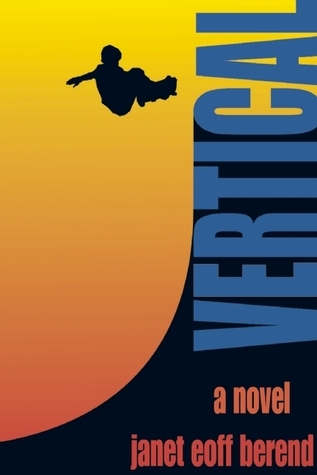 True Vert is a stand-alone sequel to Berend’s first novel, Vertical, which I wrote about here. Vertical by Janet Eoff Berend – Realistic Fiction, High School and up- I became nervous quite soon after beginning this book. First off, the book was told through the perspective of a high school boy, Josh, obsessed with skateboarding, hating high school, and pretty negative about life in general. Josh had a best friend who didn’t see quite redeeming. I wasn’t sure if I would be able to connect and appreciate this character. Boy, I was wrong. I soon got past my apprehension, started picking up and understanding skateboarding terms a little better (found out there was a glossary in the back of the book AFTER completing the book), and grew to appreciate the character development of Josh. There were many poignant characters that helped this boy grow over time and learn to stand up for himself and think for himself. I would love to see this book in the young adult book partnership where books are identified and partnered with a classic counterpart. Vertical could be partnered with a few classics but the one the Josh’s class studied and I could see a smooth connection to was Antigone by Sophocles. I highly recommend this book to high school readers. Josh is not a huge fan of school because it takes up time he could spend skateboarding with his friend Brendon. High school is complicated, though, and several things get in the way of his skateboarding. For one, he sees Lenny, a local skater thug, steal a woman’s wallet. Lenny also roughs up younger skaters and shakes them down for money. Josh is struggling with is classes, so his parents limit his skating time and make him go for tutoring, even as Brendon is in danger of flunking out of school completely. Erin, a former girlfriend of Brendon’s, seems interested in Josh, and as they work on several language arts projects together, she shows Josh that literature can be interesting as well as applicable to his own life. His tutor makes the connection between skateboarding and math, which also helps Josh see that school has some value. Just when things are looking a little brighter for Josh, he runs afoul of Lenny, with disastrous consequences. Strengths: I have lamented frequently about the dearth of skateboarding books that are NOT about kids banding together to build a skate park– this book is EXACTLY what my students want to read! There was a lot of skateboarding lingo and descriptions which I didn’t quite grasp, even though there was a helpful glossary of terms, so readers who want to replicate the skating experience in a story will be pleased. The highlight of this is the voice– Josh is snarky and disaffected, and even though he comes around to school a little, it’s not an out-of-place epiphany. Even the bullying by Lenny is realistically described, which is very hard to pull off. While this is set in high school, it would be fine for middle school. The 120 page length is perfect. Weaknesses: The high school librarian is shown reading the newspaper! With students in the library! Can’t imagine that ever happening in my library! * While Berend strikes a good balance between Josh’s hatred of school and his parents’ insistence that it’s important, it was a little uncomfortable for me to read his rants about how useless he thought it was. Students, however, will keep reading because of this. This is available in paperback from Follett– having it available in prebind would be even better. *Ms. Berend, who is an English teacher in California, says that this depiction was her way of showing her anger at her district cutting certified library staff. While the library aide in her building is wonderful, she says, it doesn’t make up for lacking the skills that a professional librarian brings to the position! This book is a roller coaster. Within the first 20 pages, Josh witnesses a burglary. “No one likes a rat” though, so he keeps quiet. As the book progresses, Josh finds himself falling out of touch with his best friend who is making questionable choices, navigating the school world, and of course—skating. There is also a violent twist toward the end that I didn’t see coming. Josh gets seriously hurt by another kid while his friend simply stands by and watches. It is a graphic scene, but it helps move the plot to a conclusion. Plus, it forces Josh to make a tough decision that he wouldn’t have been able to make at the beginning of the book. I don’t think a library can ever have too many sports books for their teens. If this is an area where you are constantly getting reader’s advisory questions, then definitely add this book. This would also be a great book for English teachers to add to their classroom libraries. The book includes a glossary of skateboarding terms and discussion questions at the end. Josh has a mesmerizing narrator’s voice; he rattles off a vacuous Valley-speak while slowly coming into his own, intellectually and morally. There is a hint of Holden Caufield about him. Vivid descriptions of skateboarding throughout the book will keep any skateboarder glued to the page. And a plot that rolls ahead constantly will maintain the reader’s attention, while intermittently sneaking in a few lessons from English and math class, which serve to advance the story. (References to math in skateboard ramp design; plus small epiphanies from Lord of the Flies,Antigone, and Of Mice and Men.) Josh starts out as a school-hating dude and slowly comes around to seeing that he can skate and be smart . . . and a decent person. I ended up liking this book a lot more than I thought I would considering it’s about an activity I know little about. I mean I’ve seen plenty of skateboarders, but I know little about the different moves and equipment and such. But the author does a good job describing the different moves and there is even a glossary at the end of the book defining the skateboarding terms that she uses throughout the book. The book felt real to me in terms of skater terminology and culture, but once again I am no expert. Josh is a likable character with a typical teenager’s disdain for school. He would much rather be skateboarding with his best friend Brendon. Although there is a cute girl in his English class, Josh wishes his parents would get off his case about his grades. And then there is the whole seeing someone steal from a car and what if anything he should do about it. And when the thief starts bullying him and Brendon goes along with it, Josh just doesn’t know what to do. He doesn’t want to be a squealer, but when Lenny goes to far, Josh must decide if he has the courage to do the right thing or not. I appreciated how the author provided Josh with parents who cared enough to discipline Josh when he let his grades slip to low. Too many MG/YA books have absentee or troubled parents, it was refreshing to read one that didn’t. I also liked Josh’s English teacher and math tutor who provided good mentors for a confused Josh. I also enjoyed how the author worked in some real math and literature in a believable way. And Josh’s reactions are so believable I almost laughed at times and then I sighed and rolled my eyes instead at these boys who think they can spend the rest of their lives skateboarding.